Engineer One Is A WebSite That Gives You Updated Information About New Career In The Field Of IT, Management, Engineering, Science And Other Domains. IT certifications validate your ability to use a specific technology or perform a particular IT job role. Information Technology (IT) is a rapidly growing field, and the knowledge possessed by IT professionals cuts a wide swath. With so much information out there and technologies changing every day, getting certified is the best way to differentiate yourself from competing job candidates and prove your contemporary skills to hiring managers and employers. While certifications don’t guarantee you a position, they often put a job candidate’s resume over the top or gain you a decent pay premium over non-certified competitors. To get certified, you must pass one or more certification exams - typically a combination of multiple choice questions and simulated real-world challenges. IT certifications make you stand apart from competing candidates in a competitive job market. Earning the latest IT certifications proves your skills are current in a rapidly changing field. Certified technology professionals earn higher salaries than their non-certified counterparts. 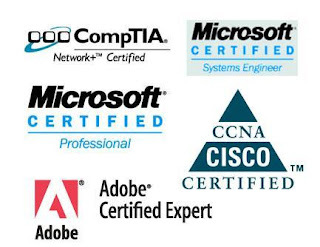 Certified IT professionals earn respect and credibility among colleagues and employers. Independent consultants and analysts can leverage certifications to win new business. 40% of certified pros credit IT certifications for helping them land a job or promotion. Committing the time and resources to get certified proves your dedication to your IT career. Certified professionals gain access to a global community of like-mined professionals. such as the opportunity-rich Government IT sector, only hire certified professionals. 75% of IT Managers believe certifications are important to team performance. Companies can use IT certifications to invest in and promote their most promising employees. IT certifications allow businesses to quickly assess candidate skill level and find the right person for the job. Companies employing certified IT professionals experience lower turnover and increased productivity. 66% of managers believe certifications improve the overall level of service and support offered to IT customers.